SYDNEY, AUSTRALIA — Trucking operations around the east coast of Australia are being hampered as two separate weather systems bring widespread disruption to roads up and down the eastern part of Australia all the way from Far Northern Queensland down to Melbourne on the south coast. The adverse conditions are forecast by the national weather forecaster, the Bureau of Meteorology, to last another three to four days. Local transport authorities are reporting numerous localised weather-related disruptions to roads such as speed restrictions, traffic delays, damage to roads and bridges, floods, road closures, vehicle-type restrictions (e.g. high clearance vehicles only), gross vehicle mass restrictions and other generally adverse or dangerous driving conditions. At least one truck rolled over and off the road in western Sydney at approximately 14:51 local time today, which caused traffic disruption for many hours thereafter. Truckers working in eastern Australia will need to carefully plan their routes and stay up to date with changing conditions. In the north of the country, tropical cyclone Owen, which has been dubbed as the “zombie” cyclone because it formerly weakened to a sub-cyclone status but then re-strengthened back to cyclonic strength, is due to hit landfall tomorrow morning (local time). The cyclone was heading away from Australia but it has reversed course and is now forecast to disrupt Queensland. It is intensifying in strength and will likely be upgraded in status to a category four cyclone before it makes landfall. Owen brings highly destructive winds, up to 200km/hr, very heavy rain, flash flooding and storm surges. Large coastal areas of north eastern Queensland are likely to fall in the path of Owen, although cyclones are highly erratic phenomena and are prone to suddenly and unexpectedly change path. Although Owen is in Far North Queensland, there are also thunderstorm and flood watch warnings across the eastern part of the state stretching south past the city of Brisbane. Gary Mahon, CEO of the Queensland Trucking Association, today explained to FreightWaves how the cyclone would affect Australian trucking. “We’ll have to wait and see. It may, or may not, affect roads. The main effects will depend on what roads are cut, where, and for how long. The main message to truckers is to stay safe and be extra cautious. Wait and see what happens. “More often than not, truckers will have to pay more by running further by driving around the cut areas. The costs are always carried by road transport. No-one ever subsidises them so the likely impact is that they will have to drive further, which means more drivers and more fuel. “The first people to get in to remote communities [that are cut off by bad weather] are the truckers. They’re very knowledgeable about their roads,” Mahon added. Meanwhile, a large swathe of the country to the south of the cyclone is also experiencing adverse weather conditions. This bad weather is being created in the mid- to south-eastern part of the country by a large low pressure zone that is drawing in humid tropical air. It is thereby causing heavy rainfall, destructive winds, thunderstorms and floods. 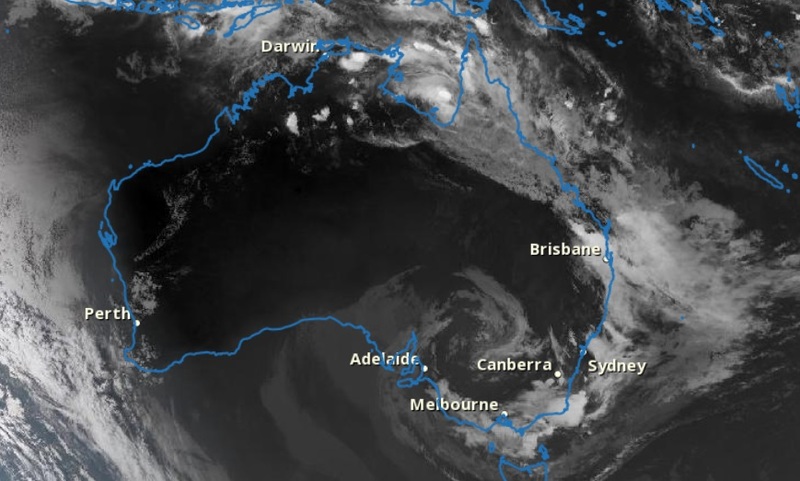 The low pressure zone is predicted by the national weather forecaster to move slowly southwards over the next few days and then over the island of Tasmania.